For those of you unaware, Angry Birds is a game that was released by Rovio in 2009 as an app downloadable on your smartphone or tablet. In this game, you use your finger as a slingshot to catapult angry different shaped birds at green pigs hiding within flimsy makeshift shelters. The less birds you use to knock down those shelters, and most importantly destroy the pigs, the more points you receive. Once the pigs are gone, you can advance a level, earning yourself achievements and even trophies. Said pigs seem to laugh at you if you fail a level, making defeating the game all the more important in your mind. In 2012, Activision released the Angry Birds Trilogy, a videogame available across multiple platforms, that allowed people without smartphones or tablets to revel in the glory of wiping the smug look off those little pigs’ faces when you knocked down their structure and were finally able to advance a level. Angry Birds Trilogy brings together three different Angry Birds games: the original Angry Birds, Angry Birds Seasons, and Angry Birds Rio for a total of 19 different episodes, which, to make each game different than the downloadable app, gives players an exclusive new level within each game. Don’t have an Xbox 360? Never fear! This game is available on multiple different platforms accessible through the library’s catalog. 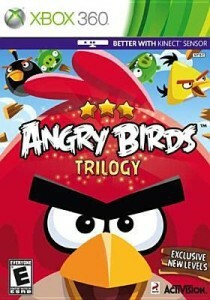 Angry Birds Trilogy is available on the following platforms: PS3, Wii, WiiU, and 3DS. Be sure to click each link to find out at which library the game is located. As always, if you have any questions, don’t hesitate to contact the reference librarians.